Several weeks ago I enjoyed a day off work by becoming re-acquainted with a lovely state park not far from my house. The day was pleasantly warm and sunny for March. As I wandered alongside the Lewis River, I was startled by the appearance of Western Coltsfoot, right there next to the path. Western Coltsfoot belongs to the Asteraceae or sunflower family and is one of our earliest blooming native plants here in the Pacific Northwest. The plant sends up stalks of white to pink flowers before the leaves make their debut, earning its colloquial name, “son before the father”. The leaves are basil shaped with five to seven lobes, green and hairless on top with a soft, white wooly underside. It is the way the young, small leaves are folded, vaguely resembling a horse’s hoof, which gave rise to the plant’s common name. As the plant matures, the leaves can become quite large. In fact, its name, Petasites is derived from the Greek word for a large, brimmed hat; palmatus means palm (palm of the hand). 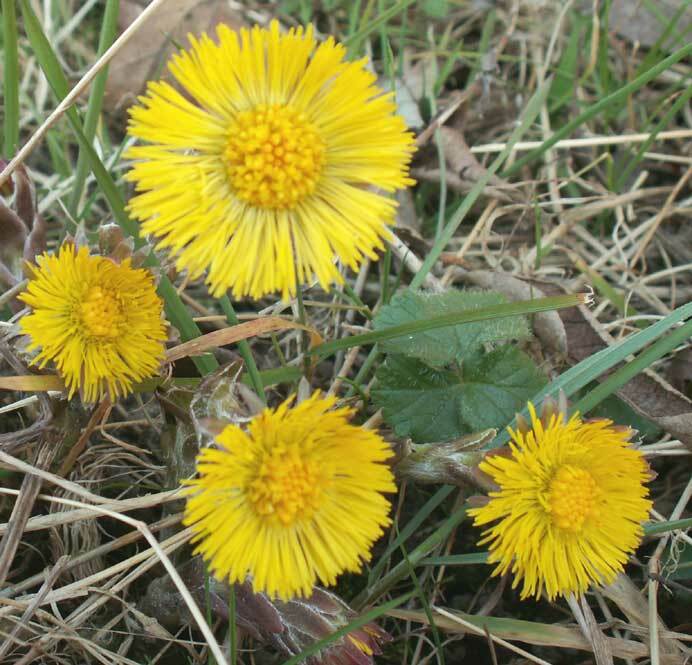 Western Coltsfoot is usually found in moist to wet forests, in clearings, along roadways or in other disturbed areas. When I first met this plant several years ago while hiking with my herbal study group, our instructor pointed out a stand of Western Coltsfoot growing along the stony edge of a small stream. He no sooner remarked how the plants prefer growing in disturbed areas when a small landslide shifted the rocks along the edge of the stream. This image has left an unforgettable reminder of Western Coltfoot’s preferred habitat. Historically, the large leaves of Western Coltsfoot were used by indigenous people to cover berries in steaming baskets [Pojar]. Medicinally, the leaves were used to treat respiratory problems such as bronchial congestion and coughs and is an excellent expectorant. Perhaps you have heard of Coltsfoot, but know it by a different botanical name, Tussilago farfara. This Coltsfoot, also a member of the Asteraceae family, is usually found in the eastern portion of the North America. It also has a flower stalk preceding its leaves, but its flowers are yellow. Tussilago farfara is used to treat respiratory conditions, as well. In his book, Stalking the Healthful Herbs, Euell Gibbons noted that in the past Coltsfoot was so esteemed for its medicinal properties that it came to symbolize all herbal medicines. When much of the population in France was illiterate, a Coltsfoot leaf would be painted on the door of apothecaries to let folks know that herbal medicines were sold there. Today, Coltsfoot is not used as extensively as it was years ago due to concern for potential liver damage from PLAs-pyrrolizidine alkaloids. PLAs are found in a number of plants, including Comfrey. Some herbalist believe it is best to avoid using plants containing PLAs for internal use (this is not an issue when these plants are used externally). Other herbalists believe that when plants containing PLAs are used with care and respect, as in the manner they were traditionally utilized, there is little concern for harm. When our class harvested Petasites palmatus leaves to make tincture and cough syrup, we waited until June-July when the leaves had grown quite huge. At this time in the plant’s life cycle, the amount of PLAs in the leaves is much less than when the leaves are young and small. PLAs help deter pests from consuming young plants, allowing them to mature. One large leaf was sufficient to make approximately eight ounces of tincture. If you decide to include Coltsfoot in your herbal repertoire, as with all plant medicines, do your research to understand its proper use, dosage, as well as contraindications. Coltsfoot should only be used for acute respiratory conditions, and not for chronic issues or for a prolonged period (no longer than four to six weeks). Also avoid using with individuals who have conditions affecting the liver, such as cirrhosis and avoid use during pregnancy. This information is offered for educational purposes and is not intended to take the place of personalized medical care from a trained healthcare professional. The reader assumes all risk when utilizing the above information. -Gibbons, E. (1973). Stalking the Healthful Herbs. New York. David McKay Company. -Goldstar, R. (2001). Family . North Adams, Massachusetts. Storey . Coltsfoot is common in roadsides, hedgerows, waste ground and stream banks and is one of the first plants to flower in Spring. It produces its flowers before its leaves. It is a perennial herb with yellow daisy like flowers and heart shaped polygonal leaves. 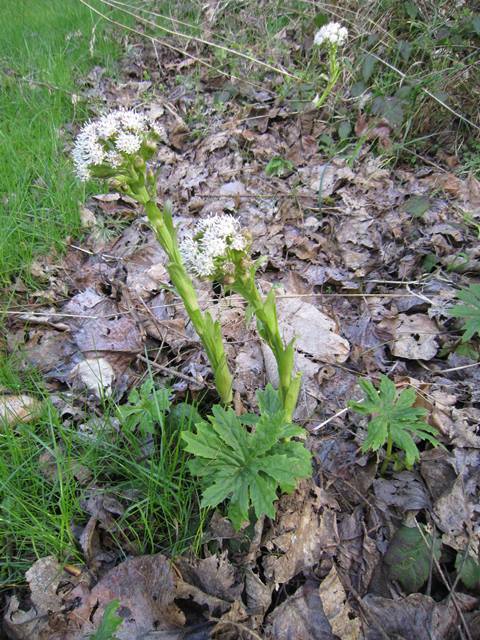 (It does look a lot like the summer flowing Butterbur to make sure you have the right plant). Its Latin name Tussilago means ‘cough’ and farfara or flour refers to the white, cottony down on the underside of the leaves. Both flowers and the leaves can be used medicinally, especially as a cough remedy. Harvest the flowers in early spring and the leaves in summer. The flowers and the leaves make a sweetish, aniseed flavour tea. It is an especially good tea to drink for all kinds of cough and upper respiratory tract complaints. The tea is very soothing and calming for a cough, and also helps moisten a dry irritating cough. Coltsfoot leaves were also used by the Greeks and Romans as a smoking tobacco. You can use the dried leaves to roll your own or smoke them in a pipe – although I am now sure how smoking would ease a cough, even if you are smoking Coltsfoot leaves but it is said to be good for asthma and bronchitis when you do so! Apparently smoking coltsfoot leaves can also sometimes cause visions. Coltsfoot combines well with mullein, working especially well on dry coughs and is good added to fennel tea. Adding fennel makes it taste nicer and has an even more soothing effect. Coltsfoot does contain small amounts of pyrrolizidine alkaloids, not all these alkaloids are toxic, and coltsfoot’s small amounts do not appear to be harmful in low doses. But I would recommend taking it for no more than six weeks in total in a year. The white down on the underside of the leaves can be made into tinder by boiling and drying and mixing with saltpetre. The seed heads can also be used to stuff pillows, although to pick enough for a pillow would take a very long time indeed! Mix chopped coltsfoot leaves with enough honey to make a paste, apply to boils and sores that won’t heal. Place a piece of gauze over the poultice and bandage in place. Change for a fresh poultice every day until healed. This will keep for months in the refrigerator. A tablespoon taken 3 or 4 times a day is soothing for a hard, dry cough and helps to loosen it. Wash the leaves and pick away the stalks, drain and put the leaves and water in a saucepan, bring to the boil, cover and simmer for 30 minutes. Cool a little, strain the liquid into a clean pan and add the honey, heat up and stir until the honey has melted, then boil steadily for 10 minutes. Skim very thoroughly, and pour through a fine strainer into a jug, leave until cool. Pour the syrup into bottles, leaving behind any sediment in the jug. Screw on bottle caps and store in the refrigerator.